His Excellency Garam Bin Said Bin Garam Almulhan presented his credentials to the President in Villa Somalia, Mogadishu. Accompanied by Somalia’s Foreign Minister, His Excellency Abdirahman Duale Baileh, the Ambassador pledged his country’s continued support to the ongoing efforts to bring security and stability to Somalia. 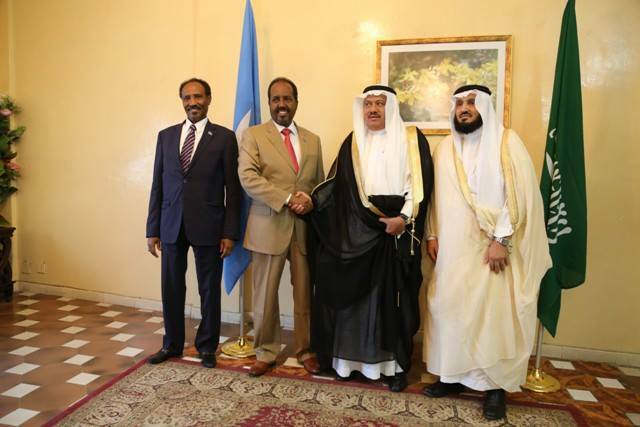 The President said: “Our brothers in the Kingdom of Saudi Arabia have been true friends to Somalia. In our time of need, Saudi Arabia has maintained relationship and has consistently provided aid to the Somali people. A recent example of the aid that Saudi Arabia has provided was through the construction of wells at a time when water was in critically short supply.